Tails & Trotters - Although we've been carrying their pork sausages for some time now, we are beginning to stock more of their fresh meats. 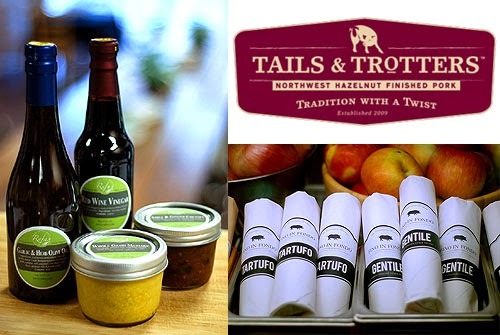 From now on we intend to have Tails & Trotters whole pork tenderloin available fresh every week. The tenderloin is extremely tender, plus it's a great value at $9.95 per pound! Let us know if you want one set aside for you. Rafns' Private Label - We are starting to package gourmet food products under our own label. Right now we have our famous Candied Walnuts, house-made Red Wine Vinegar, Garlic & Herb Olive Oil, Whole Grain Mustard, Apple Chutney (with locally-grown ginger), and Sheep's Milk Romano Cheese from Italy. New Dessert Menu - In addition to our delicious Fairview Farm Goat Cheese Tart, we are now offering excellent pies from Fordyce Farm, including Pear-Cranberry Pie and Kentucky Bourbon Pie. Come try a slice!